The feathery leaves of the yarrow plant have been used historically as an herbal tea in many countries and cultures. The yarrow plant grows native to temperate regions throughout the northern hemisphere. As a member of the aster family, it is kin to daisies, marigolds, and dandelions. Yarrow is often known by its Spanish nickname, plumajillo, which means "little feather", a name it earned from the small, feathery appearance of its leaves. Yarrow has been used historically in Europe and areas of Asia. According to legends, the mythical hero Achilles purportedly brought yarrow with his armies as to aid them along their travels. 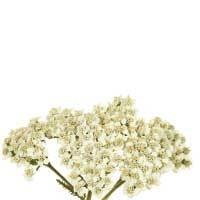 Today, tea made from yarrow may serve as a soothing herbal tisane for everyday enjoyment. Yarrow tea has been well regarded from antiquity, and for good reason. This small flowering herb offers a variety of vitamins, minerals and other natural constituents. When you partake of yarrow tea, you receive a natural boost in vitamin C, niacin, and minerals like potassium, magnesium, calcium and phosphorus. Yarrow’s prime unique constituent is achilleine, but it also a natural source of flavonoids, essential fatty acids, coumarins, triterpenes, phytosterol and natural bitters. These are merely a handful of the many constituents found in yarrow tea, and as several of them offer antioxidant properties, there is even more reason to give yarrow tea a chance. 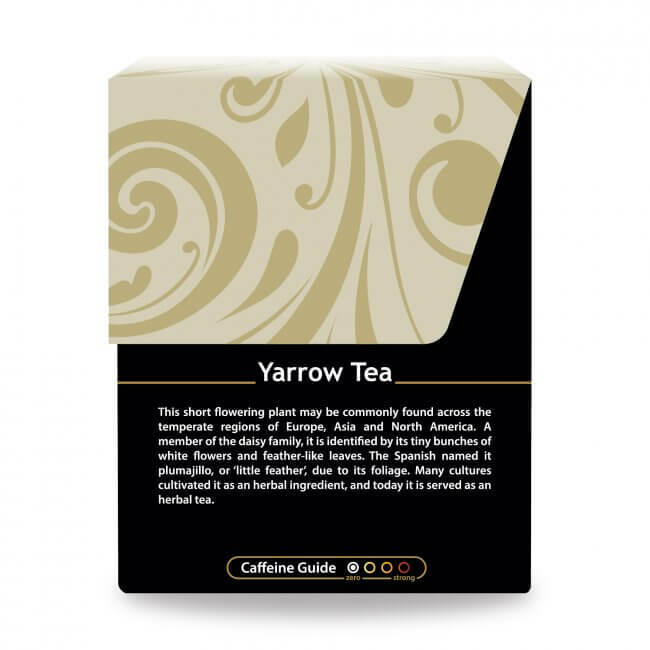 If you are interested in discovering a new herbal tea, yarrow tea is a great choice to add to your collection. Buy several boxes at once to stay well stocked, and take advantage of our bulk pricing discounts, as well as our offer of free shipping for all qualifying orders over $50. Order a box today and discover the best qualities of yarrow tea for yourself. with some other problems i was having. I am so glad i heard about this tea & i will be purchasing more. This is a very light, feathery tea. Really calms the nervous system down. Review Title: Incredible for skin! 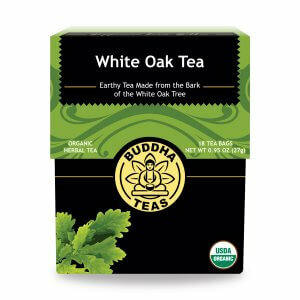 I bought this tea to use as an external rinse for severe eczema. After a few days of rinsing, my scalp and neck symptoms are noticeably improved and my face has cleared completely. I've started drinking a cup before I shower and it is a pleasant tasting tea. Tastes great, fresh, strong & good for you. Highly recommend! When I was growing up we had Yarrow growing wild in our yard, part of the lawn itself was Yarrow. 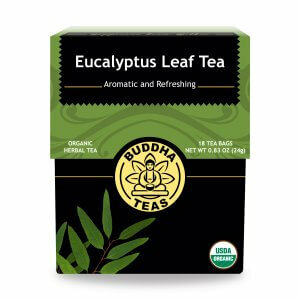 I used to keep a patch away from chemicals and make tea myself from the leaves. I missed yarrow until I found this tea. Taste good, I love it. Exactly what I was looking for in a tea. Such a raw flavor! This tea is quite bitter and much stronger than the rest of the teas I tried. But I love every sip of it. Once you have few sips, you can't taste the bitterness. I enjoy drinking it without honey or sugar. There's nothing like a cup of yarrow to make my day right again! Wow! What a tea! I thoroughly enjoy every tea that I have purchased from this website, and this yarrow is no exception. I really enjoy the taste! 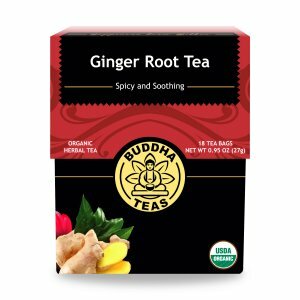 Thanks again Buddha Teas!